The emergence of the modern information society and its increased emphasis on the collection, use, and storage of personal data has enabled the growth of surveillance and the loss of privacy. Do you know your rights? Choose Privacy Week, celebrated annually May 1-7, opens library users to a national conversation about privacy rights in a digital age. 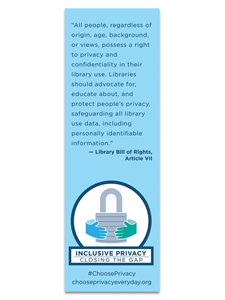 Use this poster, bookmark, and other tools to create a display, sponsor a contest, host a program or workshop, or moderate a community dialogue about privacy in your library or school. For more information and ideas about how to celebrate Choose Privacy Week, visit www.privacyrevolution.org.